Quality assurance (QA) has become an increasingly important topic, as environmental monitoring bodies realize that accuracy of measurements can depend very much on how the measurement is taken. 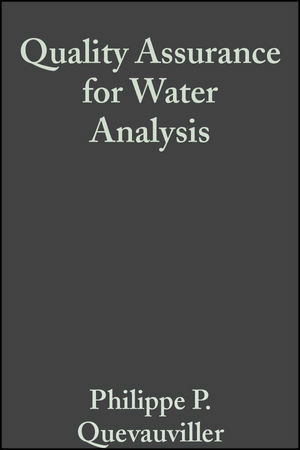 This book will describe methods in light of all of the European, US, and international (ISO) guidelines for QA of water analysis. Philippe Quevauviller has published more than 200 papers and several books linked to environmental quality measurements. He joined the Research General-Directorate of the European Commission in 1989 where he was scientific officer on topics dealing with the quality control of environmental analysis. Since 2002, he has integrated the Water & Marine Unit of the EC Environment Directorate-General where is now responsible for the development of a new Groundwater Directive which will complement the existing water policy framework. He is part-time professor at the K.U.Leuven where he teaches "water quality and treatment" in an Interuniversity programme on Water Resources.